Testing - Tribis Engineering, Inc.
One constant for bearing engineers is making reliable predictions about product performance (service life, friction, etc.) expectations. When it comes to plane bearing materials, engineers turn to PV test data to give indications about wear and friction performance expectations. Testing bearing materials at specific PV parameters can indicate a materials’ suitability, or lack of suitability for the intended operating conditions. 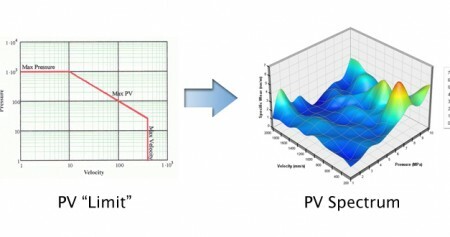 Material researchers share in the application engineers’ PV testing needs, but from the perspective of creating a new formulation to meet specific performance objectives. When developing new material formulations, material researchers need rapid turnaround of comprehensive PV tests in order to effectively screen out poor performing formulas. Tribis testing services offers bearing designers and material researchers the opportunity to obtain far more comprehensive performance data, and in a quicker timeframe, than typically available with traditional testing services. Traditional PV testing can often take several days, even weeks, to obtain data for just a few PV parameters. Tribis, on the other hand, has provided customers with PV wear and friction data across a wide ranging matrix of up to 100 discrete PV parameters with less than 24 hours of actual test time. Our standard testing report provides wear rate, friction, and heat generation results spanning a large number of pressure and velocity settings. Our reports provide unique “design maps,” 3D surface profiles of wear, friction and heat generation, that allow customers to have a quick perspective on the extensive performance data provided. Tribis also collaborates with customers for specialized testing needs. For example, we have designed test methods to assist in identifying conditions most favorable to transfer film establishment. We can create and define test configurations and protocols to suit your testing needs. Contact us, and let us know the working conditions of your products and materials.